Supporting data for "Circadian rhythms have significant effects on leaf-to-canopy scale gas exchange under field conditions"
Molecular clocks drive oscillations in leaf photosynthesis, stomatal conductance and other cell and leaf level processes over ~24 h under controlled laboratory conditions. The influence of such circadian regulation over whole-canopy fluxes remains uncertain and diurnal CO2 and H2O vapor flux dynamics in the field are currently interpreted as resulting almost exclusively from direct physiological responses to variations in light, temperature and other environmental factors. 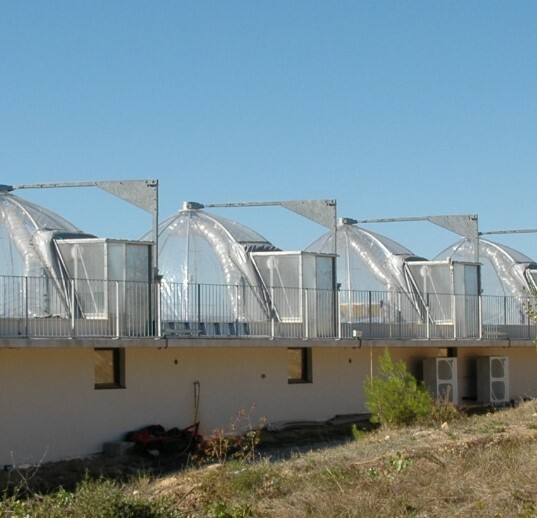 We tested whether circadian regulation would affect plant and canopy gas exchange at the Montpellier European CNRS Ecotron. Canopy and leaf level fluxes were constantly monitored under field-like environmental conditions, and under constant environmental conditions (no variation in temperature, radiation or other environmental cues). We show direct experimental evidence at canopy scales of circadian regulation of daytime gas exchange: 20-79% of the daily variation range in CO2 and H2O fluxes occurred under circadian entrainment in canopies of an annual herb (bean) and of a perennial shrub (cotton). We also observed that considering circadian regulation improved performance by 8-17% in commonly used stomatal conductance models. Our results show that circadian controls affect diurnal patterns of CO2 and H2O fluxes in entire canopies in field-like conditions and its consideration significantly improves model performance. Circadian controls act as a “memory” of the past conditions experienced by the plant that synchronizes metabolism across entire plant canopies. Displaying 1-10 of 12 Sample(s).